Aside from the fact that the volume of what people need to organize is often light-years beyond what they imagine, there is much more to getting a grip on your “work” than most realize. Managing the flow of work can be approached from many altitudes, as there are many different levels of defining what your “work” really is. Whereas we may have some lower levels in control, there are often incomplete and unclear issues at higher levels that can and need to be addressed, to really get it all under control. And often there are issues about the nature and volume of work that cannot be resolved viewing it from an inappropriate level. We have roughly categorized “work” into six levels, or horizons of focus. This is admittedly a somewhat arbitrary delineation, but it has proven valuable for many clients to frame their conversations, questions, and issues within this context. This is the ground floor – the huge volume of actions and information you currently have to do and to organize, including emails, calls, memos, errands, stuff to read, stuff to file, things to talk to staff about, etc. If you got no further input in your life, this would likely take you 300-500 hours to finish. Just getting a complete and current inventory of the next actions required at this level is quite a feat. This is the inventory of your projects – all the things that you have commitments to finish, that take more than one action step to complete. These “open loops” are what create most of your actions. These projects include anything from “look into having a birthday party for Susan” to “buy Acme Brick Co.” Most people have between 30 and 100 of these. If you were to fully and accurately define this list, it would undoubtedly generate many more and different actions than you currently have identified. What’s your job? Driving the creation of a lot of your projects are the four to seven major areas of responsibility that you at least implicitly are going to be held accountable to have done well, at the end of some time period, by yourself if not by someone else (e.g. boss.) With a clear and current evaluation of what those areas or responsibility are, and what you are (and are not) doing about them, there are likely new projects to be created, and old ones to be eliminated. Where is your job going? What will the role you’re in right now be looking like 12-18 months from now, based on your goals and on the directions of the changes at that level? We’ve met very few people who are doing only what they were hired to do. These days, job descriptions are moving targets. You may be personally changing what you’re doing, given personal goals; and the job itself may need to look different, given the shifting nature of the work at the departmental or divisional level. Getting this level clear always creates some new projects and actions. The goals and direction of the larger entity within which you operate heavily influence your job and your professional direction. Where is your company going to be, one to three years from now? How will that be affecting the scope and scale of your job, your department, and your division? What external factors (like technology) are influencing the changes? How is the definition and relationship with your customers going to be changing, etc.? Thinking at this level invariably surfaces some projects that need to be defined, and new action steps to move them forward. What is the work you are here to do on the planet, with your life? This is the ultimate bigger picture discussion. Is this the job you want? Is this the lifestyle you want? Are you operating within the context of your real values, etc.? From an organizational perspective, this is the Purpose and Vision discussion. Why does it exist? No matter how organized you may get, if you are not spending enough time with your family, your health, your spiritual life, etc., you will still have “incompletes” to deal with, make decisions about, and have projects and actions about, to get completely clear. I keep a card my on desk with these categories, from the bottom up. With the very important footnote: review regularly. I’m interested into how you got to that 300-500 estimated hours of work. So can you reveal where you got that 300-500 estimate ? Thanks for the interesting article ! 50 weeks * 40 hours/week = 2000 hours so 500 hours of work at work is 3 months. But if we allocate say 1/3 of our total to-dos to non-work, then 500 hours is 2 months. 300 hours would be about 5 weeks. Seems like a reasonable set of numbers. You’re right, I miscalculated and took weeks for days… sorry about the mix-up and thanks for the clarification ! Is there a term that is used for ‘items’ across all areas of focus? By that, I mean that my HOF has a hierarchy, e.g., personal > health , but I’m looking for a term for the actual content, e.g., “I exercise to a good sweat at least three times per week.” I can think of many words describing ‘line items’, but they don’t work across all horizons: goals, values, actions, area of focus. All I can think of currently is ‘items’. Thanks. Bob, great question. One thing that the “items” on all those levels have in common is that they are things you have committed to or agreed to. So you could call everything on the horizons some type of commitment or agreement. The commitment/agreement may be with yourself, especially on the higher levels with goals and purpose. Or the commitment/agreement may be with someone else, like an area of focus at work that’s an agreement with your employer. You know, I really don’t understand the ‘feet’ thing. It’s not just a metric feet vs metres thing; but what does 30,000 feet mean. It might be ok if you’re a pilot. Do you have another analogy? The higher your ‘airplane’ goes the more of the ground you see. When you are on the ground you might see the next few hundret meters maybe. When you are at 50.000ft you do longer see the small details but the big picture. You can see far. very far. Now you just need to look at where your overall direction should be. 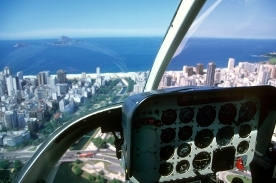 Do you want to fly in the direction of successfull bussiness owner? philosphop? barber? The idea behind David’s analogy is that at higher altitudes you get more perspective, and at lower altitudes you get more detail. You might also think of it in terms of a camera with different lenses. One might show a panoramic view of all the land. And a zoom lens might show very granular detail. Both are important views to have, not only to get things done, but to get things done that are meaningful to you. Quite interesting concept. HOF brings the whole concept of to-do-list, daily, weekly, monthly, quarterly, yearly activities, purpose, and vision into perspective. Quite helpful. In looking at this, it isn’t readily apparent to me if the 20,000 feet level are the main projects in a particular job (such as the main efforts in my job as a Program Manager) or Roles, such as Program Manager, Instructor, Group Facilitator, Writer, Researcher, Family member. Going either way seems to have advantages and shortcomings. I’d be interested in thoughts of others. Great article. I’ve read the GTD book and I use the altitude map currently. I love this thing! Simple and effective. I recommend that whoever puts one together starts with the 50,000 ft view first. Once you’re comfortable with the vision, then try to make goals at the lower tiers that contribute to the success of the vision. Try to have most of your stuff tie together like an organizational chart. Runway items tie to 10k view, 10k items tie to 20k view, etc. etc. You may have a couple of items that don’t tie and that’s OK. Just make sure that you’re dedicating enough time and energy to support your big goals. There is a tool called ‘Goalscape’ in which you perform a circles of your interest. From 50,000ft – the bulls eye – to the detail with adding another outside circles.